Improving library services to people with print disabilities: The role of technology in public libraries; Library services to people with special needs: A discussion of blind and visually impaired people as an exemplar; Library services to people who are deaf; Adaptive technology for people with physical disabilities using information and communications technology; Reaching people with disabilities in developing countries through academic libraries; Finding the means to improve services; Low-cost/no-cost ways to improve service right now; Further reading and resources. The book takes account of the key fact that to maximize their potential, people must have lifelong access to the information and services offered through books and libraries. 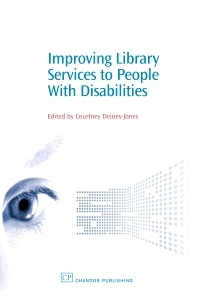 Whether to address concerns of an ageing population or to enable all citizens to contribute fully through meaningful education and work opportunities, more emphasis is being given to promoting library services to people who have disabilities. This book is a compendium of articles focused on serving adults with disabilities in an international setting. From this book, librarians, policy makers and constituents will understand the importance of serving all potential patrons, will be exposed to best practices and model programs, and will learn techniques and strategies for improving the services their libraries offer. Courtney Deines-Jones, editor, is an independent consultant specializing in universal access, services to people with disabilities, and services to older adults. She received her BA in 1984 from the University of Pennsylvania and her MLIS in 1992 from Louisiana State University. She is an active member of the American Library Association (ALA) and is the ALA representative to the International Federation of Library Agencies Standing Committee on Library Services to the Blind. Contributing authors include: Mary Beth Allen, Applied Life Studies Library, University of Illinois at Urbana-Champaign, USA; Matthew Atkinson and Jatinder Dhiensa, Loughborough University, UK; Kevin Carey, humanITy, UK; Bernadette Cassidy, Allan Bean Centre for Research and Learning in Rehabilitation (New Zealand); AnneMarie Cooke, Recording for the Blind and Dyslexic, USA; Christine Wamunyima Kanyengo, Medical Library, University of Zambia School of Medicine; Youngsook Lee, National Library of Korea; Ayo Onatola, St. Christopher Iba Mar Diop College of Medicine, UK; Christine Tilley, Queensland University of Technology, Australia.